The hotel is located along the banks of the Hennops River and is a peaceful retreat, yet not far away from the popular business and leisure areas and attractions. 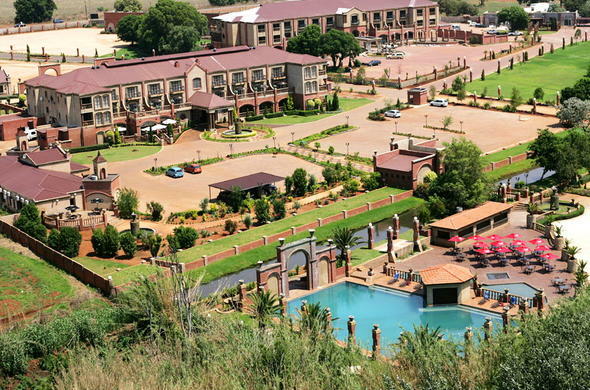 The hotel in Pretoria / Tshwane, Gauteng, South Africa is located 15kms from the city and Centurion, 25kms from Fourways and 35kms from Sandton. From OR Tambo International Airport, follow the Pretoria / Tshwane R21 signs. Travel in a northerly direction for about 45kms and then take the N1 Johannesburg/ N14 Krugersdorp off-ramp. Travel in a westerly direction for about 25kms and then take exit number 317 off-ramp (R55 Pretoria / Tshwane West). Turn right at the stop sign and travel north for 10,7km, passing Zwartkops Raceway. At the traffic lights, turn left onto the M26 Erasmia and travel southwest for 4kms. Velmore’s gate will be on your right hand side, about 500m from the bridge over Hennops River.